The nanoprobe is a free-floating 3D force probe for single molecule research. Advanced fabrication processes allow greater versatility and applications. The position and orientation of the nanoprobe is tracked and controlled by a unique active feedback sensor. Technology to manipulate and monitor on the nanometre scale is a fundamental requirement to stimulate the new era of single molecule proteomic and post genomic research. The Tweezers Nanoprobe project aims to marry the remarkable attributes of laser tweezers with those of scanning probe microscopy to provide a free floating optical imaging and force probe instrument with nanometre and sub picoNewton resolution. The instrument will probe the fundamental process of DNA damage and repair at the single molecule level and protein-lipid interactions for applications in Bionanotechnology. Versatility in probe fabrication allows greater variety of materials to be used as the probe tip. This enables use of transparent or semi-transparent materials, making the probe unobtrusive to microscopy and related analyses. Nanoprobe tip may be coated with biologically active molecules including enzymes, drugs, toxins, catalysts, DNA, RNA, or binding proteins. Effects of external movement are reduced by real-time monitoring and compensation via the feedback sensor. Nanoprobes may be constructed with multiple functionalities. Several probe tips may be held within one probe structure, each with a different active coating. Biomolecular imaging and analysis including scanning probe micropscopy, nanometre resolved topographical surface mapping, and fast transient spectroscopy. 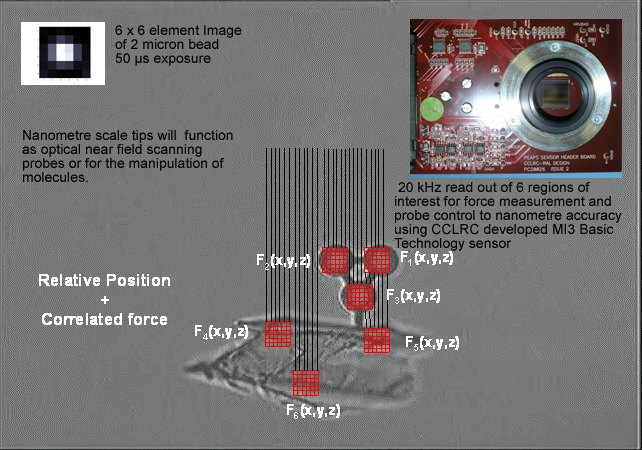 Noble metal probe tip provides combined apertureless near-field scanning optical microscopy and force probe capability. Essential to live cell analysis, enabling addition or removal of biomolecules, and therefore control over biological processes.